I turned the new cap until it clicked and steam is still escaping, causing the temp to rise. The reservoir isn't that old...options? A cap will not cause temperature to rise, it will stop the coolant from boiling. Without cap the coolant will not get above 212 F + a little because of mixture of coolant. Cap builds pressure and under pressure the coolant boils more like 260 F. Also Dorman tanks were known to have bad threads and caps. 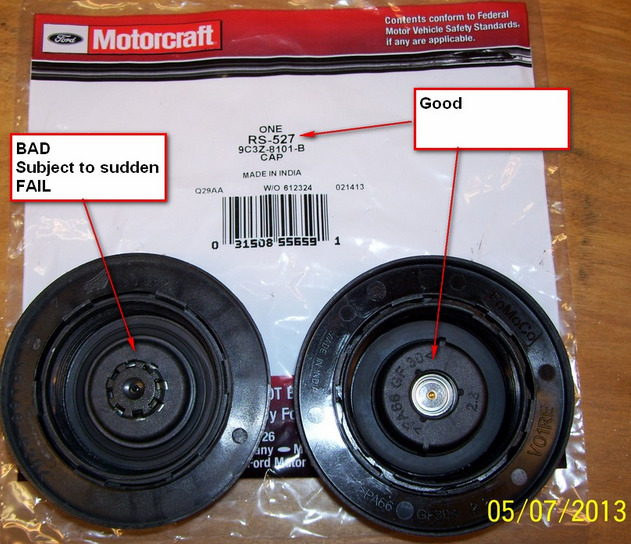 Did you use a Motorcraft cap? 2 of my 4 had coolant cap fails. One seeping, one sudden fail and it blew the coolant out of the tank and all over the engine. I was fortunate I could creep that one home before the gage went to 'H". Ford pulled all the OE caps from dealer parts and replaced them with the new design. The one I just bought (Carquest from Advance Auto), looks like the one on the right. I cannot, however, turn it until it stops. It just clicks and keeps spinning. It is supposed to go click, click when tight enough and keep on until you quit turning. I would suspect water pump fail. Low coolant often will not show on the gage sensor as it is on top. On the 24v engines the water pump has a separate small belt that drives the pump. It's under a plastic cover on the driver side end of the front valve cover. Check the belt is OK. Sorry, just noticed I looked at the wrong signature block as to the type engine. I do think the water pump is the issue, as well. or... Are the cooling fans operating normally? Last edited by 60DRB; Today at 05:57 AM.